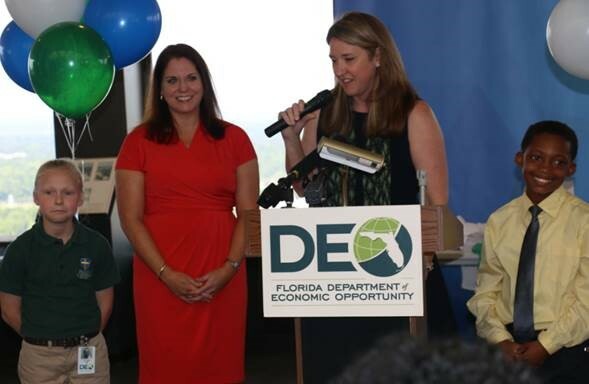 TALLAHASSEE, Fla. – Today, the Florida Department of Economic Opportunity (DEO) welcomed more than 450 children, parents and mentors to a career exploration event at the Florida Capitol during Take Our Daughters and Sons to Work Day. Children joined their parents to tour more than two dozen exhibits from a wide variety of organizations, while participating in interactive, hands-on activities and learning about the many career opportunities available to them in the Sunshine State. Throughout the day, attendees participated in interactive exhibits from educational institutions, organizations and state agencies, that highlighted the importance of education and growing employment fields in the state. Featured exhibitors included the Leon County Sheriff’s Office, VISIT FLORIDA, Florida A&M University (FAMU) College of Pharmacy, WTXL television station and Space Florida. DEO hosts a career exploration event on Take Our Daughters and Sons to Work Day each year at the Florida Capitol. Take Our Daughters and Sons to Work Day is a nationwide initiative of the Take Our Daughters and Sons to Work Foundation, dedicated to developing innovative strategies and research-based activities in informal educational programs that empower girls and boys in all sectors of society. To view Governor Scott’s proclamation for Take Our Daughters and Sons to Work Day in Florida, click here.